Ja sóc aquí. Gràcies a tothom i totdon. I'm Víctor AKA Swasky. Sometimes I draw... In fact I draw most of the days of my life, I really do and now I would rather prefer to draw than to take pictures. If you want you can visit me in Facebook or Instagram account. I always try to upload something different you will not find the same post or information in each of them. Thank you!!! 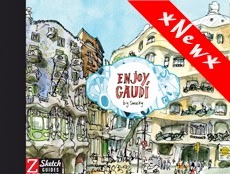 If you come to Barcelona and want to "Enjoy Gaudí" this is a great way to approach to Gaudí's work. All the buildings you can visit in Barcelona or even near to it. Enjoy it! El meu primer llibre el podeu trobar aquí. /Mi primer libro lo podéis encontrar aquí. /My first book you can find it here.